Based in Pune, Maharashtra (India), we at Prime Herbonix Health Products Pvt. Ltd, are engaged in supplying and manufacturing of aloe vera health drinks, natural aloe vera health drinks, nutritious aloe vera health drinks, immune system stimulant aloevera drink, analgesic aloevera drink and pure aloe vera health drinks. In our wide range, we offer wheatgrass powder, amla juice, garcinia indica powder, alphanso mango powder, moringa oleifera leaf powder, herbal suppliments for liver, heart, arthris, diabetes to name a few. Ever since our inception in the year 1999, we are striving rigorously to manufacture products of impeccable quality by adopting and adhering to the principle of uniformity in the business protocol. Our formulations work naturally, are pure and absolutely safe to consume. We also conduct rigorous quality checks as per set quality norms during production and packaging processes. It is our quality conscious approach that has fetched us huge appreciation from our clients locally and internationally. We manufacture our entire range of Products by following GMP (Good Manufacturing Practices). Our company is well equipped to handle diverse requirements of our Clients. Manufacturing and Trading of herbal and Botanical Food Supplements,Natural Nutritional Health Products and Functional Health beverages. The Award was presented to our Managing Director, Shri. 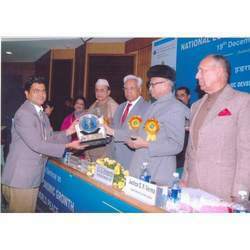 Amit Bhaskar Chaudhari by Dr.A.R.KIDWAI(Honorable Governer of Haryana) on 19th December 2008 at New Delhi. Also present at the occasion were National and International Dignitaries. Our organization is headed by Mr. Amit B. Chaudhari, who has an industry experience of 15 years in this field. He has been a true visionary, motivator and inspirational force behind the success of our company and making it as one of the fastest growing privately held companies. To expand our business reaching new horizons and achieving ever increasing levels of success through our relentless efforts and intense desire towards international recognisation. Wide range of pure, natural herbal health suppliments & botanical products, nutritional wellness products, functional fruit products and fruit juice, lifestyle and cosmetic products. Requisite infrastructure facility and ability to supply deliveries consistently for large Quantaties maintaining the optimum desired quality of the product.